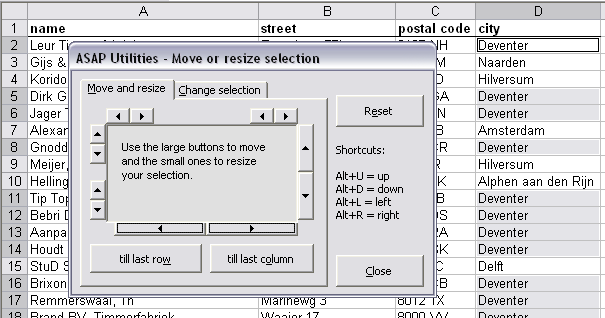 The following video will show you how to how to move or resize the selected range in Excel by using ASAP Utilities. This utility will only change you selected range of cells only, not the data underneath it. By default you can start this utility with the shortcut Control+Alt+M. Nice to see the new version ! Moving Ranges….! 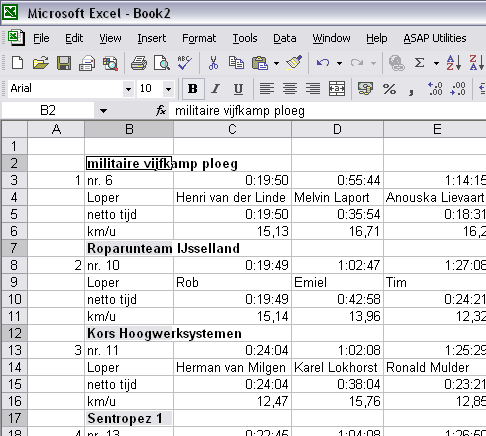 There is something like this in Excel Utilities by Rob Bovery….. But I could never make any specific use for the same. Do you experienced any particular scenarios where such can be used. I use this utility a lot in combination with the utility "Select cells based on content, formatting and more.." when I am preparing files or cleaning up data. For example when I need to publish race results I receive. The Excel file has a column with end result, start number, team name and names of people in the team below it, and the end time. Then I need to make the team names bold so I select the column with the startnumber, use conditional select to select all non-empty cells and then move the selection one to the right, one to the top and make the team name bold. Thanks for the explanation. Now I have hundred avenues open where I can intend to use it. Thanks again. Being the idle chap I am, here is another suggestion…….. The following utility is designed to help you with organizing and renaming the sheets. I know it is not exactly the same as you suggest, but I'm sure this utility can be useful. Surely, I tried that… But that doesn't work for this purpose…. or I am not aware of the exact steps that are required for the purpose. The present procedure says that the new name should be in Cell A1 of each selected sheet (and if the new names are on a sheet which is not to be renamed, then the names should be in the 1st cell of the selected range for each sheet). What I feel is it would be less time consuming to rename the sheet one by one instead of writing name in cell A1 of each sheet and then using ASAP to rename all of them at once. But if the same can be done through a list like above "Old Name" to "New Name", it would make the things much easier. Have you tried doing something like that…….? Cannot Change part of a merged cell. This is indeed a bug. I will fix it and send you an email as soon as the pre-release of the new version is available. If things go as planned, that will be later today. This is a very useful little trick – thank you for sharing and creating an easy to follow video. « Just released: ASAP Utilities 4.5.2!